Like Blue Beetle, Captain Atom was a Charlton character inserted into the DC Universe in 1985’s Crisis on Infinite Earths. DC published another seminal comic maxi-series the following year, featuring a modified take on all of the Charlton characters with Alan Moore’s Watchmen. Moore’s genre-redefining take on a superhero team and the world that contained it was so bold that DC suggested he use analogues of the Chartlon characters, rather than the originals. In this way the faceless, crime-solving detective the Question became the similarly attired Rorschach. Blue Beetle became Nite-Owl. And Captain Atom became Doctor Manhattan. Thanks to the huge popularity of the Watchmen franchise, Doctor Manhattan is today a more widely known character than Captain Atom. The latter starred in the Justice League in the 80s, but has always been a member of DC’s second or even third tier. I’ve read a lot of his appearances in big crossovers and stuff, but I can’t say I’ve ever read a story that featured Captain Atom as the main character. J.T. Krul’s take on Captain Atom is to basically make him Doctor Manhattan completely. Doctor Manhattan in the Watchmen is at the pinnacle of power. He can create duplicates of himself, rearrange matter, basically anything. Captian Atom himself has never really been portrayed as that powerful, but from the first pages of the story right on through, we see Captain Atom experience a significant fluctuation in his power level. When coupled with the fact that Jose Villarrubia’s colors depict the Captain as completely blue and that the formerly hirsute character is now almost completely bald, and the Manhattanization of Captain Atom is in full swing. Unfortunately, J.T. Krul is about as far from Alan Moore as the New 52 has yet provided, and like his previous effort in Green Arrow #1, all we get is a bog-standard superhero comic that feels like it could have come out of the 80s or 90s, with very little fresh or new to hook new or returning comic readers. 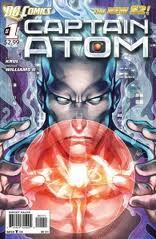 We get a lot of Captain Atom worrying about his powers (unless he concentrates, his body itself starts to lack molecular cohesion and lose its form), some stilted dialogue between the Captain and his colleagues at a high-tech research facility called the Continuum, and a plot involving a volcano popping up in the middle of Manhattan for reasons that aren’t yet clear. What we don’t get is much of a sense of who Captain Atom is, what drives him, what he believes, or really anything other than the present situation about his powers growing dangerously. There’s nothing here to surprise or delight. Just more of the same superhero stuff they’ve been shoveling out for decades. If you’re looking for a fresh new take on superheroes, or even just a comic that takes more than six minutes to read, you’re going to have to look elsewhere. Sadly, I agree with you, Erik. I have liked Captain Atom for years and this is one of the biggest let downs DC has put out , so far. I liked his solo book from the 80s, most of his supporting cast, and his various times with the JLI/E/A/etc. He’s been an unevenly used super before, but here, he’s almost completely void of anthing meaningful or useful. Plus, the nuclear mohawk looks stupid. Power-wise, Dr. Manhattan had more in common with Dr. Solar, Man of the Atom, then the original Capt. Atom. It sounds like Krul simply didn’t do his homework.